AvX continues to be a horrible fiasco that I am now only reading in order to fully appreciate Andrew Wheeler's commentary. My friend said, before I started AvX, that issue #6 was a turning point with Mark Waid taking over the writing. He and I read a different issue #6. 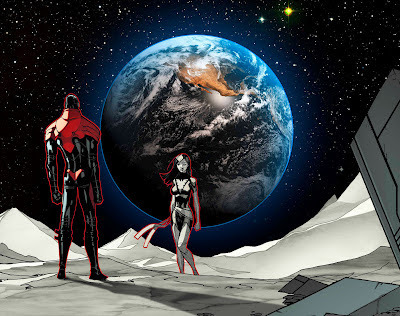 Or rather, he was referring to AvX #6: Infinite, which offers a whole new - old - perspective on Scott Summers by reminding us that, despite all this power, he is very much human and is and always has been the leader of mutantkind. The man raised to carry the weight of his race on his shoulders. Love or hate him, Scott is what he is and this issue shows him at his finest: those moments when Scott questions himself and turns to Jean for reassurance/confirmation. As much as I disliked the Scott/Jean relationship, mostly because of how it limited Jean, I can't deny Scott these moments. Especially when he's wearing a questionable thong wielding the power of a god. This story is reminiscent of the Classic X-Men sidestories that I adore so much. And this is where the AvX story should have been focused, rather than on the ridiculous "Versus" issues and the continuous out of character characterizations and nonsensical plot. It's unfortunate that Marvel did not make more of these Infinite stories to go with the core books. Unlike the other ancillary books I've read so far, this one lacks the continuity issues of the others. It fully connects to the story told in AvX #6 (and actually makes some of the moments make sense). It addresses some of the nagging issues I've had along the way, such as no on seeming to remember anything about how Dark Phoenix was handled previously, including the weapon Jean used to kill herself. You'd think Beast would have mentioned it to Tony. It also remembers that this story started with Hope.